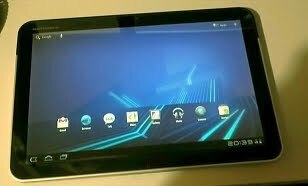 Motorola Xoom - it will be nice when it's finished | Mike Hitchen Online: Mike Hitchen Unleashed - telling it like it is! Optus has sent me a Motorola Xoom Tablet, to trial for one month so I can blog and tweet my thoughts on its merits or negatives. I receive no benefit financial or otherwise for doing so. Here are my impressions after three days. The Xoom is a nifty looking device all sleek and shiny - and so far, that's just about the only thing it has going for it. Once you stop looking and pick it up, you immediately notice the weight - far too heavy to lug around with you all day. Then you start using it, and that's where the problems really begin. It has one of the most frustrating and unusable UI's I have ever come across. Hidden menu bars appear from nowhere, then when you actually want them, no amount of touching will bring the damn things back. Many simple WebPages wont fully open, forums do not display properly, (even though I can access and use them with a $44 phone!). Once you have a webpage open, links either refuse to respond, or open by themselves. One minute you are in the middle of reading an article about Kate and William, than suddenly find yourself on the fashion page! When I use a touch screen, I expect speedy and consistent response - not hit and miss. Videos are another problem, taking far too long to load and too many stutters. I have just played a 2 minute news video faster on the $44 phone, than using Xoom. Google Earth works well and so does the "Navigation" facility and built in GPS, though to be honest, why I would pay upwards of $500 to find out where I am and where the nearest loo is, is beyond me. Transferring files from my PC to Xoom was straightforward but that's a basic operation that not even Xoom can make too difficult. Sound quality on music files is reasonable but not sensational. It seems that Motorola have fallen into the same trap as other companies in their eagerness to bring out a product to compete with Apple, and come up with an unready, bug ridden product with a dysfunctional UI, that renders it little more than an expensive MP3 player with delusions of grandeur. I shall persevere for a month, seek out it's good points and keep you updated. At least I can use "Navigation" to find a hair clinic to replace all the hair I am likely to pull out using the almost unusable interface!